Dr Alice Grady is using implementation science and new technology to translate public health research into real-world benefits for the community. Improving public health requires robust research—but that’s just the beginning. Dr Alice Grady is using new technologies, such as web-based programs, to put evidence into practice in a way that is effective, sustainable and can be scaled up to reach more people. By turning research into action, Alice is helping to prevent chronic diseases and create healthier communities. “To impact lives, we need to implement evidence-based practices that help to improve people’s health behaviours and prevent chronic disease. Digital interventions, such as online programs and phone apps, are a promising and potentially cost-effective solution. Alice is particularly interested in improving children’s health and nutrition through clever online systems. One of her collaborative projects successfully developed a web-based program—titled feedAustralia—to help over 50 childcare services across NSW adhere to the required dietary guidelines for children. Carried out in partnership with research institutes and health service providers, the evaluation of feedAustralia was a winner at both the 2018 Hunter New England Excellence Awards and the 2018 NSW Health Awards. The innovative program has gained national attention, garnering $1.2 million in funding support from the Commonwealth Department of Health to be expanded nationwide. While public health research continues to uncover answers and new hope for communities, our knowledge of how to successfully implement the research findings in a meaningful and scalable way remains limited. Alice’s research explores the barriers and enablers to rolling out effective health interventions—helping quality programs and research benefit more people. “Poor implementation of evidence-based practices in community and healthcare systems can significantly hinder local, state and national efforts to prevent chronic disease, such as childhood obesity. Alice’s research is contributing to global impact. Over the past few years, she has collaborated internationally with prominent evidence-driven organisations such as the Cochrane Collaboration and Word Health Organization. Her work has been published in renowned journals such as The Medical Journal of Australia, been presented at 22 national and international conferences, and received more than $330,000 in funding. 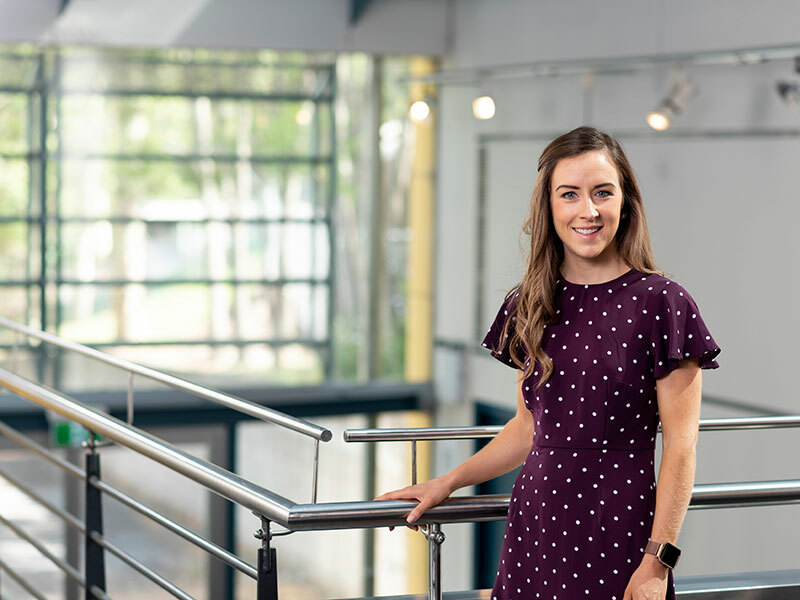 In 2018, Alice was invited to further hone her research and academic skills as a participant in the ThinkWell Early and Mid-Career Women’s Development Program, facilitated through the University of Newcastle’s Faculty of Health and Medicine's Gender Equity Committee. Alongside her research, Alice also supervises PhD students with the University, allowing her a valuable opportunity to pass on her knowledge and expertise. 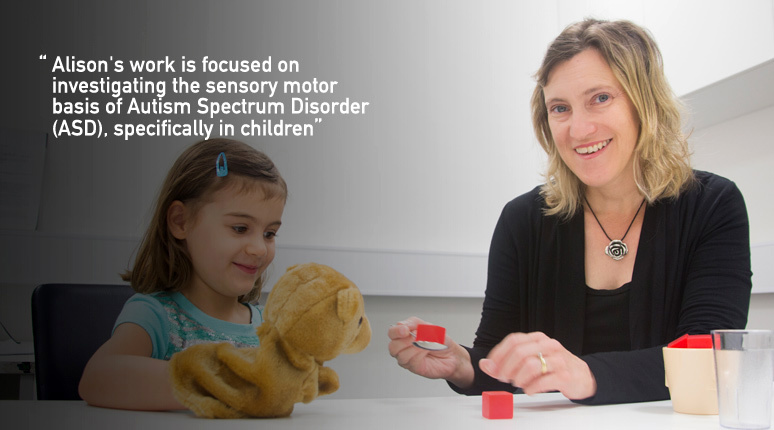 Alison's work is focused on investigating the sensory motor basis of Autism Spectrum Disorder (ASD), specifically in children, and anchored on three simple but essential questions regarding how they react to sensory input. Are sensory behaviours the same in all children with ASD? If not, what causes differences? And how might understanding differences affect the targeting of therapies? Years of clinical occupational therapist practice in non-government, community and hospital settings informed Alison's understanding of the barriers to participation children with ASD face. "As occupational therapists we use clinical instincts and input from parents to design interventions in an attempt to grow the capacity of children with ASD to manage their behaviours and emotions in normal daily situations," Alison says. "However, the research to back up our approaches has been lagging. My research is a contribution toward understanding the nature of these sensory behaviours." "With better understanding we can choose better targeted therapies, and hopefully, we'll see better outcomes." Unlocking the secrets of sensory features could vastly improve the lives of many people with ASD, and their families. Alison notes that not all children with ASD have difficulty with sensory input, and not all children with sensory issues have ASD. "We think around 60% of children with ASD have these difficulties," Alison states. "So although not every child with ASD has them, it is the majority, and there can be significant issues." Alison explains by citing a school fire drill as an unexpected stimulus that may unsettle any child. Most children could, she says, follow instructions and ultimately cope. Comparatively, the same disruption could have a major negative impact on a child with ASD, for whom responding appropriately could be extremely difficult. "Another sensory stimuli is touch," Alison explains. "Somebody might touch a child to redirect them, but the child may misinterpret the type of touch and perceive that quite aggressively, as a hostile touch." "Their general ability to function in their environment is compromised because they experience these various sensory inputs very differently and then that affects their general behaviour." Alison's major piece of work to date has been the definition of four distinct sensory subtypes in children with ASD. This discovery has been replicated in three independent studies. An algorithm based on a simple questionnaire for parents assigns children to a particular subtype. There are two factors determining the appropriate subtype. The first is a child's sensory reactivity, or as Alison explains, "the intensity of their response to sensory input." The second factor is multi-sensory integration, the ability to integrate and combine multiple sensory inputs that are coming at the same time. "We have one group that has problems with sensory reactivity, one has problems just with multi-sensory integration, one has problems with both, and one has no problem with either," Alison reveals. "And there is a severity dimension." "So the group who has the problems with both have the most sensory symptoms. The ones that don't have issues have the fewest. And the other two are in the middle." Classifying children into subtypes means therapy can be specifically targeted for maximum benefit. Next, Alison is keen to investigate whether the replication within subtype groups is isolated to sensory features so therapy can be further customised. "We are trying to establish whether children in a common sensory subtype tend to also have common difficulties or strengths in other areas, like IQ, general behavioural issues and communication abilities," she discloses. Working with a multi-disciplinary team of University of Newcastle experts, including Professor Ulli Schall, Dr Juanita Todd and Dr Bill Budd, Alison is looking at event related potentials. Using neuroimaging to measure the electrical activity of the brain, preliminary data suggests that the sensory subtypes do have different brain profiles. "Parent reported distinctions in behaviour are matching with some basic distinctions in sensory processing in the brain," Alison reports. "There is a lot of interest in investigating whether subtypes relate to physiological differences, and even further back, at a cellular and genetic level, are there patterns there?" Understanding the links between behavior and biology may reveal new methods of treatment. Alison's work has already begun to inform treatment, and has the potential to change the anticipated trajectory of children with ASD through early diagnosis. She is also looking for sensory-related patterns in intervention outcome data in partnership with early intervention providers, such as the AEIOU Foundation for children with autism. It is the first year of life, however, that Alison believes may hold the key to early diagnosis, and therefore offer parents a greater window for intervention. "Sensory and motor systems are necessarily intertwined in the first year," Alison explains. "The motor system is developing, and we know that motor skills are highly dependent on the accurate interpretation of touch, movement and body sense information." Using video data of babies with known outcomes involved in longitudinal studies, Alison is recording response to sound and touch in an attempt to try to code early sensory motor features. To further our understanding of early sensory motor development in non-autism groups, Alison is now working with the asthma team at the Hunter Medical Research Institute on a large scale study to track sensory motor outcomes in babies born to mothers with asthma. By carefully following large cohorts of young babies with risk factors for medical and developmental difficulties, Alison hopes to pinpoint the sensory motor features in the first year in life that are related to autism risk in later childhood. "If we study sensory motor development in a very rigorous way in children who have risk factors for ASD, then follow them through to see which of those children go on to get ASD, we hope to identify early developmental delay." "Working with babies, we have the potential to change their brain wiring, modifying their responses so they find sensory stimuli less distressing. Both as babies and later in life"
Over 20 years of experience in paediatric occupational therapy practice, health service management, research and teaching are useful background to a major role in the genesis of a new collaborative of researchers interested in neurodevelopment at the University of Newcastle. Reflecting on her career, Alison admits that it wasn't just her compassion for children with ASD that drew her sole focus. "Early in my career a fellow academic and parent of a child with ASD, put together an Autism research group," Alison recalls. "She saw me in a meeting one day, and said 'I need an OT for my research group and I pick you.' This area literally chose me." Discovering how few people internationally were investigating ASD related sensory difficulties, Alison resolved to research this area in depth. "I think we have made some really good inroads to be honest," Alison says. "This area still has so much potential which is exciting." "And we can already be a bit more discriminatory with therapies. With so many to chose from, I think that is really helpful." 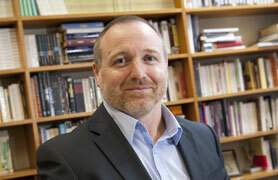 Associate Professor Alistair Rolls is at the forefront of what many may consider 'irrelevance' and he is proud of it. He is a leading expert on Twentieth and Twenty-First Century French Literature, the principal English-speaking scholar on the immortalized French writer Boris Vian and is paving the way forward in the field he calls Fetishism Criticism, a discourse which recognizes that two opposing narratives can co-exist while actually refuting each other. "I believe deeplythat in order to grow and expand as individuals – to access something precious – we need to do irrelevant things," Rolls says. "My academic research on literature and poignant literary figures allows for just that. It encourages everyone, not just the academic community, but also a wider audience, to take a text, engage with the words, interact with the message and ultimately form a relationship with the book." "Now I ask: Have you changed in anyway? Have you grown? What ideas have been ignited?" Rolls says. He takes this concept one step further and poses this: "If you can read a piece of work, digest it and never change your thoughts, then it doesn't matter what you read, it will have no impact." Rolls proclaims that this is the power of literature. "It's what you - the reader – actually do with the book that matters and it all begins with irrelevance." Rolls recalls how pure serendipity played a key part in launching his love affair with the often misunderstood genius known as Vian; the focus of his PhD and countless academic publications that followed. "I was working in a French high school in Bordeaux as an assistant when a fellow teacher gave me several of Vian's books. I began reading his works and didn't have a clue where to start. He posed a challenge unlike other authors I was well acquainted with. I couldn't box him or define him; so instead, I proposed an alternative way to understand him. A series of different lenses, including fetishism and intertextuality which shone a light on his literary brilliance." Vian remains one of the most well-known popular culture characters in French history, but is disproportionately under-valued alongside other leading French figures of the time, Rolls argues. "Vian had an extraordinary breadth of talent. He was a writer of books, poems, short stories, plays and songs and was also an accomplished jazz musician, mathematician and engineer by trade. Yet, he remains frustratingly misunderstood because he is considered a jack-of-all trades and master of none." Reflecting on the highlights of his career thus far, Rolls says "I was extremely privileged to join an expert panel of three at the Sorbonne in 2007 and to deliver a keynote speech at the first major Vian academic conference. This was the most flattering honour. Then, in 2010, I was listed in the bibliography of the first collected works of the author, which was a significant acknowledgement of my contribution to understanding the artistic talents of Vian and his influence on our culture." Rolls is an ideas person and is always exploring new ways and mediums to challenge the norm, provoke new thought and expand creatively. "My new fascination is crime fiction, and in my book Paris and the Fetish: Primal Crime Scenes, which is due out early 2014, I explore reasonable and radical re-reads of various texts through fetishism. In the Freudian understanding of Fetishism this basically means we know something not to be true but believe it to be true at the same time," Rolls says. 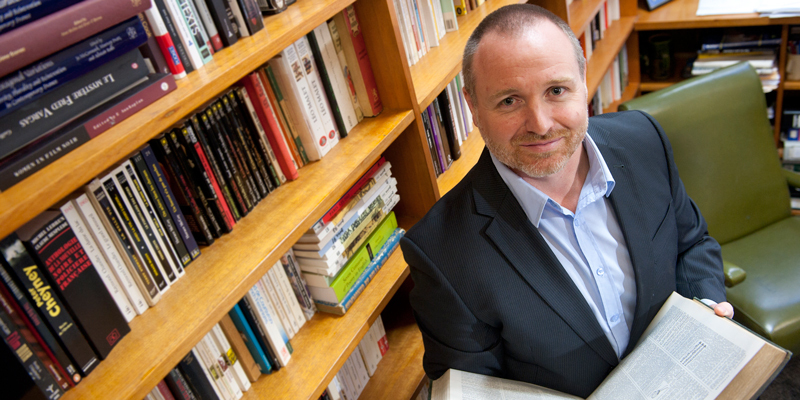 He will also be collaborating with several colleagues from the University of Newcastle from the English and Classics disciplines on the production of articles focusing on various authors. "This is a unique opportunity to take a new approach - an innovative perspective - and do something irrelevant, but likewise, so very relevant to our personal growth and the intellectual development of our society." 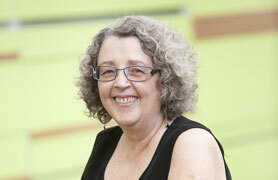 Professor Alison Ferguson explores novel communication strategies for people who have lost speech and language function. Loss or impairment of speech and language can be a tragic consequence of brain injury, but involving those close to the patient in their recovery can greatly enhance the injured person's ability to regain communication skills. "Communication is not just about one person - it is always a synergy between two or more people," explains Professor Alison Ferguson, a Faculty of Education and Arts (FEDUA) speech pathology researcher whose specialty is communicative interaction. "There may be a limit to what therapists can do working with the patient alone, but there is an infinite array of things we can do to improve the communicative process by involving partners, family and friends." Ferguson began working with brain-injured patients in hospitals after completing her undergraduate degree. She undertook her doctoral research in linguistics, which gave her the ability to better analyse communicative interaction. "Speech pathologists have a strong focus on multimodal communication," Ferguson says. "People think speech pathologists just work with speech but people communicate in a variety of ways - through facial expression, tone of voice, gesture and, of course, writing or drawing. So all of that can be incorporated into a therapy program." Ferguson has a strong record of collaborative clinical research and is a member of the Centre for Clinical Research Excellence in Aphasia Rehabilitation, a national, multi-disciplinary network of clinical and research specialists that is supported by the National Health and Medical Research Council. She was part of the team who established the discipline of Speech Pathology at the University of Newcastle in 1994 and contributed to the formulation of a national benchmarking system for speech pathology education. In recent years she has published two influential books in her field, Expert Practice: A Critical Discourse and Researching Communication Disorders (co-authored with Professor Beth Armstrong). Ferguson, along with her colleague Dr Elizabeth Spencer, is currently involved in a novel collaboration with FEDUA colleague Professor Hugh Craig, a pioneer in the field of computational linguistics renowned for his groundbreaking computer analysis of the works of Shakespeare and his contemporaries. Ferguson sees great potential in applying those same analytical tools to the large data sets speech pathology researchers need to establish benchmarks of 'normal' speech. "We need in our research to use closely matched control subjects - in other words, we assess the language used by someone with brain damage against the language used by a healthy person of the same age, gender, education level and background," Ferguson explains. "But there is a range of variation in 'normal' language use so we need to determine that range and it is difficult to get large sets of data that capture the full variation. Ferguson says the research is innovative in a number of ways, not least of which is the unusual nature of the collaboration. "Speech pathology is a multidisciplinary field but I never thought I would be collaborating with a Shakespearean scholar - I think we can safely assume that is a world first," she laughs. "But one of the delightful things about being in the Faculty of Education and Arts is the company you keep, and the interesting partnerships that can lead to." Alison Ferguson explores novel communication strategies for people who have lost speech and language function.